Over the years WordPress has gone from being a simple blogging platform to a complete Content Management System (CMS) that is capable of running even some of the most complex websites. Tons of websites are using WordPress due to its ability to easily manage content, SEO benefits and because of the ability it gives virtually anyone to create an astonishing website without having to pay tons of money to a web developer. One of trends I have noticed lately is people using WordPress to create a Real Estate website where they can show off property listings. The Real Estate industry is booming and many are taking advantage to earn some extra cash by advertising real estate listings. And Real Estate Agents are now creating their own websites to showcase their properties to their clients in a much more professional way. For Agents creating a website could really help you grow your business as well as reach a broader audience by showcasing properties online that people can view/find across the globe. And what better way to build a website than with WordPress. Below you can find some of the Best premium Real Estate WordPress themes that exist out there and that will allow you to easily and quickly set up your Real Estate website. Please note that these are all premium WordPress themes, so you will have to pay for them, but the price of a premium theme compared to paying $1,000 to a web developer is a real bargain! This clean real estate WordPress theme is super sleek with clear cut content, support for retina images, built-in IDXpress plugin support, a front-end submission system and even a page builder. And that’s just the beginning. Contempo really outdid himself and packed a lot of great features any real estate agent or property management company will love. Decorum is an elegant option for promoting your listings. Although the layout and style is minimal, this theme is feature rich and ready to use. The theme of course has great options for custom post types, advanced search and image sliders – but it also comes with an unlimited use license, so you can create as many real estate sites using Decorum as you’re like. This top selling Themeforest theme is perfect for showcasing you properties across your home town, the continent or even the globe. Built specifically for real estate and rental property websites, Realia features a responsive and retina ready design, lots of color options, dsIDXPress support and super easy property management capabilities. Need a translatable theme for clients in other countries? No problem – Real Homes is translation ready and supports the awesome WPML WordPress plugin. Additionally this theme comes website ready with advanced theme panel options, plenty of page templates (listings, galleries, agents and more), custom widgets and the option for users to signup and pay for property listings on your site (a great way to monetize your website!). Elegant Themes is one of the most popular theme bundle sites on the web, so naturally they have a wonderful real estate theme in their library. ElegantEstate is just that – elegant, clean and super easy to set up. This professional theme makes it simple for buyers to browse your site, and with Google maps integration and custom property info/photos you can showoff what’s best about each listing. Like we said before, Contempo has done a great job with each and every real estate theme he’s pumped out – and WP Pro Real Estate 3 is no exception. The theme includes a wonderfully useful homepage property map with pins for each of your listings. Plus there’s even an easy to use child theme creator included, so if you need to tweak the theme you can. Realtr is a great option if you want to create a site where agents can list their properties. Create and manage submission packages and collect payments all through your awesome real estate site. Plus Realtr includes full MLS/IDX support and the option for you (as the admin) to showcase select properties on your homepage. Creating a responsive real estate site is easy when you use the OpenDoor WordPress theme to get started. Options for layouts, custom colors, banners, Google Maps, dual listing agents, custom per page contact forms and an advanced search make setting up your real estate site simple so you can get down to business and start selling properties. PremiumPress is know for their advanced themes, and their Responsive Real Estate WordPress theme definitely lives up to their high standards. The theme is fully responsive, includes easy media uploads (image, video, audio, docs), Google Maps support, social sharing integration and listing membership package options (so you can make money from other people posting on your site). There are even free child themes included to quickly change up the look of your site. This modern and minimal WordPress theme is a great way for your to promote your listings or rentals. There are 2 theme layouts and 6 homepage templates to get you going, and from there you can use the powerful theme panel to set your options. Homeland also includes dsIDXPress support to instantly pull listings from your MLS accounts, and the custom shortcodes make it easy to personalize your posts and pages. Another great real estate theme by Contempo, WP Pro Real Estate 2 includes a filterable homepage listings map as well as a standout advanced search box so buyers and quickly and easily find the home of their dreams. There are tons of other theme features you’ll love including membership submission packages, custom property fields, custom widgets, dsIDXPress support and much more. Residence is a traditional real estate WordPress theme developed by Gorilla Themes. Adding your listings is easy, since the theme includes live MLS data support so you can see all your current properties right on your own website. The theme also supports videos (perfect for property tours), custom agent pages, Facebook integration and even a financing calculator. 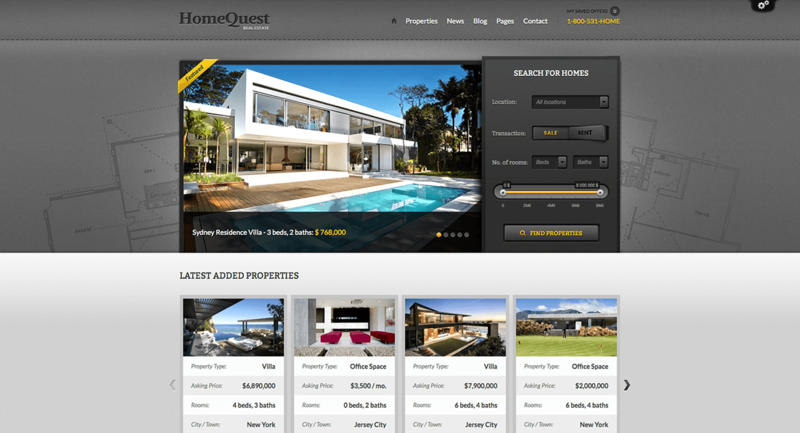 Built for real estate agencies, directories and brokers HomeQuest has lots of great real estate related features to make your listings stand out. A graphical search design, property features, styled galleries and quick links to “like,” print or email a listing are just a few of the awesome features. Plus the powerful advance search and filtering options make it super easy for users to browse your listings and put in an offer. With dsIDXPress plugin support, unlimited color options, 5 property post layouts, 5 custom blog designs, the knockout Revolution Slider, WPML translation support and even the PSD files Real Estast is a solid theme option when creating your real estate website. The theme also includes an easy to use mobile menu so buyers can checkout your listings on the go. Freehold is easy to use and customize, which leave more time for you to sell, sell, sell! The fully responsive layout, custom Google maps, unlimited colors, advanced search, built-in social sharing, multiple agent support and property sorting features are just some of what’s included. Freehold also comes with video documentation and PSD files so you can quickly set up and customize your theme in no time. As you browse through the themes listed above you may want to look for the following features that would be a great asset to your Real Estate website. Featured Properties: A featured properties section would be a great way to showcase some of the top properties, the properties you really need to sell now or you can sell these featured spots to Real Estate Agents who want to promote a specific property/house/rental. Property Finder: Make sure the theme has a powerful property finder that allows you to search by different criteria, such as number of bedroom, location, price..etc. This will make your site easier for the users and could help increase your sales. Google Maps: Google Maps integration is a really great way to help visitors know exactly where a given property is located or even see the listings in the street view. Agent Profiles: Some of the themes above come with the ability to create Agent Profiles, this is a great feature if you want to create a real estate site where agents can pay to showcase property listings. Contact Agent: The ability to contact the agent from the listings page makes it really easy for people to get in touch with the agent without having to look very hard for a number or email address. Multiple Images Per Listing: Make sure the WordPress theme supports multiple images per listing so that you can show various parts of the house or property. It will give your users a better idea of what the place looks like without having to visit or go to another website to look. Very good list of themes. Thank you for including Homeland in this list..
hello there, boss. can I download a free theme? I was really desperate looking for a really good one for real estate website and it’s only now that I found one. I was going nowhere with different themes as they really don’t serve my purpose. Very nice blog. Thanks for sharing this theme list. Unfortunately there aren’t really any great free ones because they are pretty complex to create it takes a lot of time, money and effort. That said, because of this it makes it very exclusive sounds like a good project for me to take on this year. I’ll add it to my todo list to make a nice free real estate theme this year! This is a excellent post that you share with us.I think that your article has many information about Best Real Estate WordPress Themes.I feel very excited. I personally use placester and think it is one of the best themes I have ever used. It works great with IDX integration and is well worth it. That said, I pay monthly for it. These are excellent themes and really seem like they are worth a check before spending money. Nice collection. I have used RealEstaty for one of my client’s site. it has lots of interesting features.